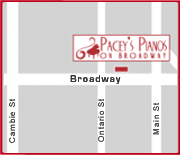 Pacey’s Pianos serves the Tri-Cities, providing new and used pianos in Coquitlam, Port Coquitlam, Port Moody, Maple Ridge and Pitt Meadows. We cover all areas in eastern Metro Vancouver from Burnaby to Mission. Further, we provide full service to the Tri-Cities and surrounding area including piano moving, piano tuning, piano service, piano restoration,and piano rentals. We are the Coquitlam piano store.